What is a coat of arms and how did it originate? During the Middle Ages, more specifically the twelfth century A.D., we find the European socioeconomic system of feudalism supplying the order and structure of medieval society. National armies did not exist, but lords and nobles, in exchange for their royal grants of land, were obliged, if called upon, to supply their sovereigns with military forces drawn from the ranks of their landholders. The landholders, in turn, owed a debt of military service for their privilege of holding and working the land. These men were "nobilis" or known. They were the upper class and known as gentlemen. When summoned by the king to war, these lords and nobles, and those who served and followed them, were obliged to bear arms. These men were the first "knights in shining armor". During the twelfth century A.D., when these knights served their kings with honour and valour, a form of symbolism developed in which these early knights would adorn their shields with decorations and emblems and carry banners into battle. With the advent of the Crusades and the evolution of body armor that completely hid the knight's identity, it became a military necessity to somehow identify the combatants, to know friend from foe. During the Crusades, knights began to wear a woven surcoat to protect their armor from heat and moisture. These surcoats came to be decorated with the same symbols and emblems adorning the knights' shields and became indicative of the knights' ancestry, accomplishments, and distinctions. Figuratively, this arrangement came to be known as one's "coat of arms" or "arms", to be authorized and granted by one's sovereign, whence came the expression "the right to bear arms". Passed down from generation to generation, a coat of arms served as a proud symbol of the family's history, identity, and unity. How many coats of arms do you have in your reference library? RAMPANT LION COLLECTIONS'® research library has over 2,000,000 recorded coats of arms for surnames of European ancestry. Approximately 1,000,000 are immediately accessible from our in-house database, while the other 1,000,000 coats of arms are available in 24 - 48 hours. During office hours (PST) a coat of arms image, if available, can be faxed or emailed to you in minutes. (See the "Heraldic Parchments" section for details and fees.) Approximately 90% of European surnames have recorded coats of arms. How do I know that this parchment with my coat of arms and surname history is accurate? RAMPANT LION COLLECTIONS® has licensed the oldest heraldic/surname research facility in North America to provide us with guaranteed authentic documentation on the oldest recorded coats of arms for surnames of European origin. RAMPANT LION COLLECTIONS® has access to recorded coats of arms for approximately 2,000,000 European surnames. Surname histories are available for nearly 1,000,000 European surnames. Why is my coat of arms different from the one researched by RAMPANT LION COLLECTIONS®? Our heraldic research facility seeks the oldest recorded coat of arms for one's surname. Your coat of arms may be different for a number of reasons. It may be more recent and hence subject to important life events that would alter its appearance, e.g. royal marriage, meritorious achievements in the military, social, financial, or political arena, grants of royalty. Or, your ancestors may have added a crest or motto to the family's coat of arms. Or, heraldic artists may have added artistic flourishes and interpretations which appear to modify the basic coat of arms. What is a coat of arms used for? Aside from identifying sovereigns, knights and warriors during the Middle Ages, one's coat of arms was often used to mark and authenticate documents and communications. Signet rings engraved with coats of arms acted as seals by leaving a relief impression of the coat of arms in sealing wax. Such signet rings, known as "family crest" or "coat of arms" rings, are the ultimate symbol of personal identity and pride in family. Passed down from generation to generation, a coat of arms served as a proud symbol of the family's history, identity, and unity. What options does one have if RAMPANT LION COLLECTIONS® can't locate a coat of arms? If RAMPANT LION COLLECTIONS® is unable to locate a family coat of arms for your surname, we have two other options. Firstly, we can research your mother's surname to see if a coat of arms had been recorded. If that second search is unsuccessful, then we can assist you in creating your own coat of arms. Can I design my own coat of arms? Yes, we can assist you in the designing of your own personal coat of arms. We ensure that the depiction of the heraldic symbols and colors is done according to heraldic tradition. How did one acquire a coat of arms? Later on, success in business or finance was added to military accomplishments as a justification for the granting of a coat of arms. Do women have a coat of arms? Depending upon the heraldic rules of the country in question, a woman might or might not be legally entitled to bear arms. In the United States, there are no rules forbidding a woman from using her family coat of arms. What are the technical terms for the various elements of a coat of arms? The most significant element in a "coat of arms" is the shield, as the shield is the "canvas" upon which heralds and heraldic artists depict the symbols, emblems and colors specific to one's coat of arms. In battle or in tournaments, the devices and symbols displayed on one's shield were the means by which medieval knights, covered from head to toe in armor, could be identified by both their followers and their enemies. The mantle is an ornamental design, often depicted in armorials of coats of arms as draping the helmet to both sides of the shield. Originally, a lambrequin or textile covering was worn over the helmet and hung to below the shoulders to protect the knight and his armor from heat and moisture. When worn in battle, the lambrequin was subject to sword slashing and hacking and often ended up in tatters and literally "cut to ribbons". In their renditions of coats of arms, heraldic artists would embellish this torn textile covering by adding their own artistic flourishes. The colors of the mantle usually reflect the predominant color of the shield and crest. Fan shaped ornaments attached to the top of knights' helmets in the 12th century A.D. were an integral and protective part of the helmet. The origins of the "crest" began with the painting and decoration of these fan ornaments with designs replicating charges or devices from their owner's shields, thus reflecting their individuality and further serving as a means of identification in battle or at tournaments. A crest is an important component of a coat of arms, resting atop the wreath or on top of a knight's helmet, and further personalizes your family's symbol. Beginning about the time of the Renaissance, coats of arms began to be decorated with war cries, slogans, and philosophical exclamations. These maxims were called heraldic mottos and were often displayed on banners either above the helmet crest or below the shield. What is unique to one's coat of arms? Generally speaking, a coat of arms consists, at a minimum, of three elements: The helmet, the mantle, and the shield. The helmet and the mantle, though subject to artistic interpretation, are basically the same for most coats of arms. What is unique to an individual's or family's coat of arms is the nature of the shield. In the science of heraldry, the description of a shield is called a blazon. In heraldic language, a composite of English, French, and Latin, the colors, furs, metals, partitions, ordinaries, sub-ordinaries, and charges of the shield are described in detail. Though not necessary for a coat of arms, a crest and/or motto are two other elements which are unique in combination with one's shield and help to identify and differentiate one coat of arms from another. Heraldry is the art and science of the symbolism represented by coats of arms. The rules of heraldry govern the creation, regulation, granting, description, use of, and inheritance of coats of arms. Is heraldry different in other countries? The rules governing medieval heraldry developed along national or regional lines. However, the essence of heraldic art, purpose, and function was universal and understood by all medieval Europe. Do Jewish surnames have coats of arms? In the late Middle Ages and early Renaissance periods, meritorious accomplishments in arenas other than the battlefield were often rewarded with titles of nobility and grants of coats of arms. Many Jewish families are known for their early contributions in the fields of business and finance and were recognized with grants of coats of arms. Do other cultures or civilizations besides Europeans have coats of arms? European coats of arms arose as a form of battlefield identification in the 12th century A.D., chiefly during the Crusades to the Holy Land. European climate, suits of armor, and military tactics provided a backdrop to the unique development of European heraldry. In heraldic art, a coat of arms is composed, at a minimum, of the elements of a knight's battle dress: Helmet, shield, and lambrequin (mantle). These elements, a full suit of armor and a cooler climate, did not exist in every culture and civilization. In some cases, other cultures have developed their own distinct forms of heraldry, e.g. the Japanese ka-mon. But coats of arms as we know them are distinctly European. What is a Scottish Clan Badge? It is alleged that early clan chiefs presented a metal plate with their coat of arms crest to their followers as a badge. By affixing this badge to their clothing with a strap and buckle, clansmen demonstrated their allegiance to their clan and chief. When not being worn, the strap and buckle were coiled around the crest. This eventually led to the stylized interpretation of the Scottish clan badge as shown below. 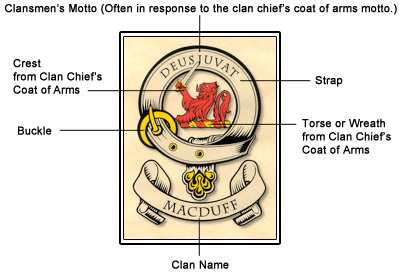 And so, the custom has evolved for a Scottish clan chief to allow the crest of his coat of arms to be used in the form of a clan badge. All clan members, including septs and dependents, are entitled to display and wear their Scottish clan badge. We have over 35,000 Scottish Clan Badges in our reference library. A signet is any kind of a marking tool that can leave a relief impression of a coat of arms, crest, monogram, logo, or hallmark. A signet ring is one in which these images have been engraved intaglio ("negative" image) so that a "positive" relief seal can be created using sealing wax. These seals have been used for centuries to authenticate letters and communications as coming from he whose arms were presented. Why should one own a coat of arms or family crest ring? As the ultimate personalized gift, a family coat of arms piece of jewelry is destined to become tomorrow's heirloom. Wearing our family coat of arms jewelry acts as a symbolic connection to our ancestral history, gives us a sense of belonging to something larger than ourselves, and brings honor to our ancestors and family name. Can I use my coat of arms on a RAMPANT LION COLLECTIONS® ring? Our master hand engravers can engrave any image on our jewelry. Because you already have your own coat of arms, we would prefer to work with yours, as it has a probability of being more historically accurate for your branch of the family than ours might be. Can I use my mother's coat of arms instead of my father's? Coats of arms are generally inherited from the father's line of descent. However, there is historical precedent for coats of arms to be inherited from the mother's line of descent as well. If your father's coat of arms cannot be located, then using your mother's family coat of arms is a viable option. Can I incorporate both of my parent's coats of arms on a signet? There is tradition in heraldry called the "marshalling of arms" whereby the different coats of arms of a husband and wife combined to form a single marital coat of arms. Heraldic tradition determines which of the two methods, dimidiation or impalement, should be used when forming the new coat of arms. This "marshalling" allows a couple to create a new family coat of arms, and engraved upon a signet, an instant family heirloom. Why is a coat of arms ring such a versatile gift? Wearing a family coat of arms signet reunites you with an ancient tradition and brings honor to your ancestors and family name. It is the perfect gift for all the men in your life, and women love them as well. I thought signet rings came in one basic style? Why do you have so many different signet ring designs? Traditionally, signet rings are devoid of design with a very low profile. RAMPANT LION COLLECTIONS® is known for their extraordinary men's jewelry. By applying their design expertise to the basic signet, RAMPANT LION COLLECTIONS® has created five revolutionary signet concepts that update the classic signet ring, give it better dimension and feel, and offer countless customizing options, all the while still retaining its classic feel. Why are these signet rings so expensive? I've seen others for less money. Signet rings from RAMPANT LION COLLECTIONS® combine substantial weights of the finest gold and platinum alloys with revolutionary signet ring designs, meticulous craftsmanship, and master heraldic hand engraving to create one-of-a-kind works of heirloom art. This is a case of comparing our Mercedes Benz signets with their Chevrolet signets. RAMPANT LION COLLECTIONS® signet rings are comfort fit. What does that mean? RAMPANT LION COLLECTIONS® designs all their signet rings to have a raised area on the inside of the ring shank that runs the entire length of the shank. This modification, called a "comfort fit", results in a comfortable, smooth feel as the ring is put on, worn, and removed. Traditional signet rings are not made comfort fit. Why is there a lion carved on the inside of the ring? A ring of substance, built to last generations in lustrous metals with heirloom quality craftsmanship. Unrivaled heraldic and surname research. Hand engraving by heraldic masters in the centuries old intaglio technique create one of a kind artistic masterpieces. Can I order a coat of arms ring in other karatages or colors? What different inlay materials are available? First, RAMPANT LION COLLECTIONS® must fashion the basic signet to precise specifications, and then, through a very detailed and exacting process, the signet is hand engraved using the intaglio technique by master heraldic artists. As they say, all good things are worth waiting for. RAMPANT LION COLLECTIONS® signet jewelry pieces are artistic masterpieces and destined to be tomorrow's heirlooms. If an engraver focuses exclusively on coat of arms detail with no regard for engraving depths, then his engraving will not provide a strong enough relief sealing wax impression. And conversely, if an engraver focuses solely on carving a deep engraving, then he will be sacrificing precious coat of arms detail. At RAMPANT LION COLLECTIONS®, we strive for the perfect blend of artistic flourish and deep intaglio hand engraving, thereby creating artistic masterpieces that reflect the highest level of the engraver's art. Can I have my last name engraved with the coat of arms? Heraldically speaking, engraving your surname under the coat of arms is redundant since the coat of arms represents your family surname. Also, engraving a surname on the signet takes up precious space that could be better used in enhancing coat of arms' detail by increasing engraveable shield size. We can, however, engrave your surname on the sides of the ring shank, either north/south or east/west, depending upon style and length of surname, or on the inside of the shank. Do you engrave the motto on my coat of arms? We can engrave your motto on our signets below your coat of arms. However, we would recommend that you only do so on our larger styles, which boast a much larger engraveable surface area that allows for an engraved coat of arms and a motto without sacrificing coat of arms detail. Engraving a motto on our medium size rings takes up space better used for enhancing the detail in your coat of arms by increasing engraveable shield size. How does an engraving show the rich colors in my coat of arms? In a coat of arms, the background color of the shield is called the "field". The field is usually composed of one or more of the recognized colors, metals, or furs. When these field colors/metals/furs are depicted graphically, a system of engraved hatchings, termed "heraldic tinctures", are employed to represent true heraldic colors/metals/furs when real heraldic colors/metals/furs cannot be used. White covered with black spots representing ermine tails. A variety of squirrel skins used for lining cloaks. When sewn together, the fur patterning, alternating blue-grey and white, resembles alternating bell shapes. Do you engrave for sealing? Our standard procedure is to engrave the directional orientation of a coat of arms to duplicate the coat of arms image as it is viewed on our parchments. If you wish to have your wax seals duplicate the directional orientation of your coat of arms image, then we would engrave the coat of arms image in "reverse for heraldically correct wax sealing." Bear in mind that if you were to request reverse engraving for wax sealing, your engraved motto or surname would not be legible as the letters would all be backward. Can I have something other than a coat of arms image engraved? We can engrave any image supplied by our customers. Typically, we might engrave your initials, your coat of arms shield, your coat of arms crest, or any other artistic images you might like. Is it possible to make a wax impression seal? Most of our signet styles are hand engraved by masters in the centuries old intaglio fashion in which a "negative" image of a family coat of arms, crest, monogram, logo, or hallmark, is carved into the metal. When this intaglio carving is pressed into molten sealing wax, it creates a "positive" relief image of the carving that can be used as a personal signet or seal. How can I make a wax seal? When you order your personal piece of signet jewelry, we will supply you with two sticks of European sealing wax, detailed instructions on how to create your own personal wax seals, and a packaged wax seal made from your engraved signet.